PRESCOR provides elliptical tank heads which are used in many pressure vessel environments. An elliptical tank heads depth of dish is one-quarter of the vessel’s internal diameter and by adding the straight flange to the depth of dish will result in the inside height. Elliptical tank heads are an economical solution for medium pressure tanks, due to the reduced metal thickness requirement. Click here for PRESCOR's 2:1 Elliptical capabilities and safe minimum chart. 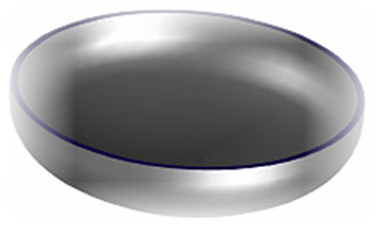 ASME elliptical 2:1 flanged and dished heads are used in the construction of tanks for unfired pressure vessels, such as liquefied petroleum gas and air receivers. Tell us what you need, and we will tell you how we can help you.